View More In Garment Covers. 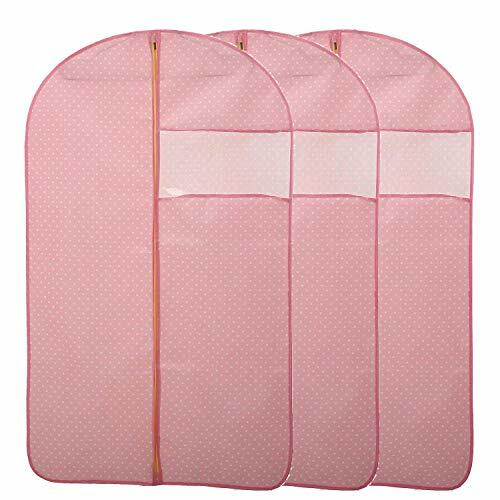 This set of 3 garment bags is perfect for travel or long-term storage of your clothes.These garment covers are sturdy yet breathable. They feature a clear plastic window that makes it easy to identify the type of clothing inside. Additionally, a reinforced hanger opening ensures they will last a long time, and a sturdy full-length zipper ensures easy access to the bag's contents. Finally, a metal eyehole is conveniently placed at the bottom of the bag for easier storage and travel. KEEP YOUR FORMAL DRESSES NEATLY STORED AND ORGANIZED - This must have long gown garment bag has a clear vinyl pouch that allows for easy labeling, helping you keep your dresses perfectly organized. In addition, the sturdy center zipper and the reinforced hanging hole assures unmatched durability and maximum protection. IDEAL FOR A WIDE VARIETY OF GARMENTS - Although this is the best bridal dress garment bag, it can be used for other purposes too! It makes the perfect bridesmaid, pageant, christening, evening, graduation and ball gown storage bag! What is more, you can use it to safely store your dresses, leathers, furs, suits and more! If you have any questions about this product by TEERFU, contact us by completing and submitting the form below. If you are looking for a specif part number, please include it with your message.